Casa Iulia Lucretia is a studio apartment located at the ground floor of a historic building of XIV century, just in front of a beautiful view on Augustus Forums (Fori Imperiali) and the huge columns of Temple of Mars the Avenger. After the entrance hall surrounded by 'sanpietrini' and historic columns you'll arrive to the apartment. At the entrance there is a kitchenette (equipped with everything you may need), then there's the main room with a wardrobe, a dining table, a futon that easily opens becoming an extra bed (70cm x 200cm : 27in x 79in) and a comfy European-Queen size bed (160cm x 200cm : 63in × 79in). Going few steps up you'll access to the anteroom (with washing machine and shelves where there is the First Aid KIT and my cleaning stuff) and then to the bathroom where you will find a bidet and a relaxing bath-tub with shower. The house is equipped with microwave, fridge, gas cooker, vacuum cleaner, washing machine, 2 small cloth-lines, iron and ironing board, cutlery, pots, dishes, glasses, towels, bed linens and maybe some small plants that have survived my “black thumb". For children 0-4 years old I can provide a cot and a high chair, for free charge obviously! # Finding parking in Rome is very hard, imagine then in a protected area of the Historical Center! So if you know you'll come by car please let me know while you are booking. Ciao! My name is Giulia and I was born and raised in Rome. I'm a tech enthusiast, I love Luc Besson movies, I've being a website developer, a librarian, I graduated in International Politic Science and I've founded a non-profit organisation on a suburb of Rome creating an info-desk about Autism and Dislexia. Thanks to an idea of my little sister Lucrezia 10 years ago I started firstly exchanging my studio apartment with other people across the Europe (do you remember the movie "The Holiday"? Sadly no Jude Law appeared) and then sub-renting Casa Iulia Lucretia - the name I gave to my absolutely not fancy but cozy home - during specific periods, such as university breaks and holidays, in order to support me, my studies and my projects. Then two years ago, for several reasons, I decided to sub-letting it full time in any season. Thanks to this opportunity I've met lot of fantastic and extraordinary people from all over the world!! This apartment is located within a few blocks of the Colosseum and it is surrounded by ruins. It’s located on a quiet street, just off the area where you can peer down into the Forums. The Main Street is vibrant and crowded, but it was a pleasure to return to this little gem. Location was fabulous and Gulia was a delight. Comfortable, safe, perfectly placed gem! This place was the perfect find! My friend and I came to Rome to see the country our ancestors came from. Our host was very helpful in giving us information on how to make day trips to the villages we wanted to visit. She kept in touch to make sure we were enjoying our visit and kept us informed of issues such as weather concerns and how to get a taxi. The apartment itself is very close to the metro, and within walking distance of several "must see" sights in Rome. It is clean and cozy with a comfortable bed. We cooked a couple of meals in the kitchen. It was just a fabulous place to stay in order to take in Rome and the surrounding country side. Our host was very communicative throughout the whole process and stay. I highly recommend this place! The property was in a fantastic location within walking distance to all the major attractions we wanted to see plus it was close to public transport. Giulia was extremely helpful both before and at our arrival. I suggest this property is best suited to a couple. Thank you, Giulia! My wife and I enjoyed our stay here. It was within walking distance to all the main sights to see in the heart of Rome. While not a 5 star hotel the small apartment met all of our basic needs and gave us the feel of living like a Roman. There are several great places to eat and several markets for groceries within walking distance of the apartment. The Termini Train station is also within walking distance or a short taxi ride for 10 euros or less. Giulia the host was awesome. Her comminication and suggestions were timely and helpful. We would definitely stay here again. Easy access to many sights and great places to eat! Casa Iulia Lucretia is in "Rione Monti" (Monti district), the oldest e most central neighborhood in Rome but there is a good balance between romans who live here from generations, students and tourists. At the main little square of the neighborhood (Piazza Madonna dei Monti) the atmosphere is pleasant and perfect for a chit-chat. So the apartment is really close to Roman Forums, Trajan's Market, Colosseum, Capitol Hill, Trevi Fountain, Spanish Steps, etc., in few words: main attractions are within walking distance. However nearby there are 2 Metro B line (Colosseo stop & Cavour stop) and many bus stops, so you'll be able to reach even the most remote place of Rome. The district is full of restaurants, wine bars, artisan shops, etc., but the building is not attached to any of those places, which means your sleep will be peaceful! 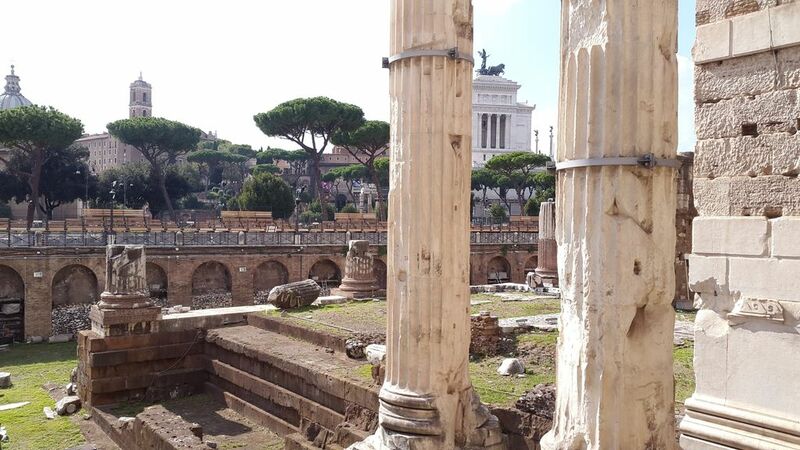 Thanks the proximity to Termini Station, it is also easy to reach those unmissable places outside Rome such as Villa Adriana, Villa d'Este and Villa Gregoriana in Tivoli or Ercolano and Pompeii. # CLEANING FEE: 30€ to be paid cash or by credit card at the arrival; # TOURIST TAX: 3,50€/person/night up to the 10th night; # No extra fees if you'll arrive late or evening/night; # WiFi: obviously for free; # If you'll get here by car you have to know that finding a parking lot is really hard (possible but hard), generally parking on blue stripes costs 1€/1hr. Still, the apartment is situated in a Limited Traffic Zone which means that you can access only after 6pm.